· In an era of heightened corporate transparency, greater workforce mobility, and severe skills shortages, culture, engagement, and retention have emerged as top issues for business leaders. These issues are not simply an HR problem. · Organizations that create a culture defined by meaningful work, deep employee engagement, job and organizational fit, and strong leadership are outperforming their peers and will likely beat their competition in attracting top talent. This year, employee engagement and culture issues exploded onto the scene, rising to become the No. 1 challenge around the world in our study.1An overwhelming 87 percent of respondents believe the issue is “important,” with 50 percent citing the problem as “very important”—double the proportion in last year’s survey. Two-thirds (66 percent) of HR respondents reported that they are updating their engagement and retention strategies (figure 1). 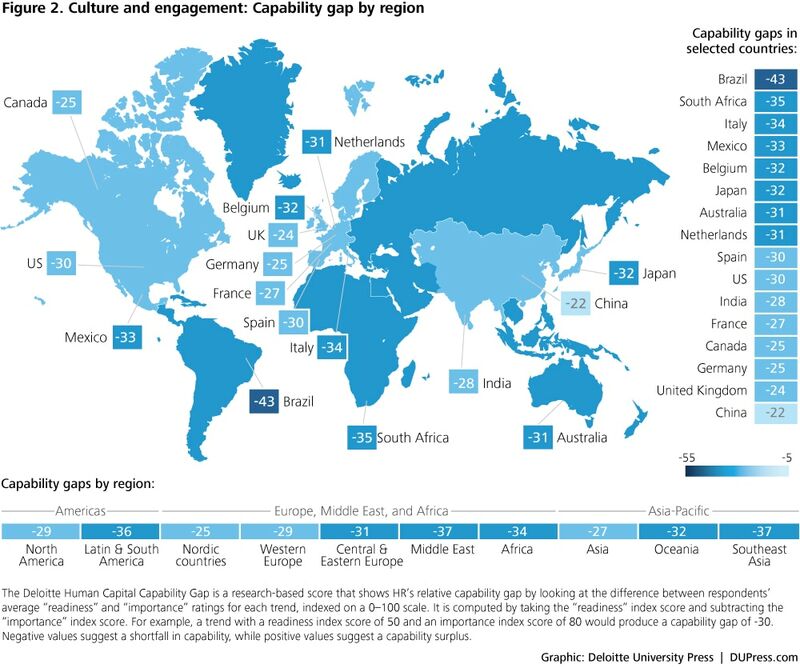 Along with decreasing readiness, our data also showed substantial capability gaps in engagement and culture across countries and regions (figure 2). · Employees are now like customers; companies have to consider them volunteers, not just workers: As the job market has heated up and new technologies have exploded, power has shifted from the employer to the employee. Websites like Glassdoor, LinkedIn, Facebook, and others not only increase transparency about a company’s workplace; they make it far easier for employees to learn about new job opportunities and gain intelligence about company cultures. · Leaders lack an understanding of and models for culture: Culture is driven from the top down. Yet most executives cannot even define their organization’s culture, much less figure out how to disseminate it through the company. · The new world of work changes the way we engage people: The world of work is very different from and more complex than it was only a few years ago. Employees today work more hours and are nearly continuously connected to their jobs by pervasive mobile technologies. They work on demanding cross-functional teams that often bring new people together at a rapid rate. Flexibility, empowerment, development, and mobility all now play a big role in defining a company’s culture. · Engagement starts at the top: Make engagement a corporate priority, and modernize the process of measuring and evaluating engagement throughout the company. Benchmark the company, strive for external recognition as validation of efforts, and reinforce to leadership that the engagement and retention of people is their No. 1 job. · Measure in real time: Put in place real-time programs to evaluate and assess organizational culture, using models or tools to better understand where it is strong, where it is weak, and how it really feels to workers. · Make work meaningful: Focus on leadership, coaching, and performance management to help employees make their work meaningful. Reinforce the importance of a coaching and feedback culture, and teach leaders how to be authentic and transparent. · Listen to the Millennials: Their desires, needs, and values will shape the organization’s culture over the next 10 years. · Simplify the work environment: Read our research in this report on the simplification of work to help reduce the burden of today’s 24/7 work environment. Companies have learnt from their customers that great experiences are rewarded with greater loyalty and engagement, driving a windfall on both top and bottom lines: Customer satisfaction up 20%, Revenue up 15% and Cost of serving customers down by 20% (McKinsey). The acknowledgement of customer experience as a driver of competitive advantage is accelerating: As reported in this study, 75% of companies said their top objective was to improve customer experience. CEOs and Executive Teams now commit more time and attention to CX. Why should we care in HR? What can HR actually do to improve the employee experience? While the sum of all three experience components constitutes the full employee experience, HR directly controls the first type of experience only, created when providing HR services to various personas in the employee base. This is the Customer Experience of HR (CXHR). CXHR is one of the few direct drivers of Employee Engagement that HR fully owns and is able to control and improve over time. As an obvious low hanging fruit, it is the first port of call for HR leaders aiming to improve the Employee Experience and give their teams clear marching orders. Components two and three are more challenging to tackle operationally, since they’re only partially owned or just influenced by HR. However, HR teams will develop new CX capabilities and skills through deploying CXHR in their own ‘backyard’ (see Volker Jacob’s article – ‘The What and How of a digital strategy’). As such, HR will become the top contender to fully own the broader Employee Experience Agenda and drive component 2 and 3 – an important discussion indeed, but outside the scope of this article. The idea of CXHR is intuitive, and many progressive HR leaders are acting on it: Staffwise is forecasting 100% increase in employee experience roles on LinkedIn this year. However, the field is far from being mature and practitioners find precious few supporting tools, technologies or existing practices to accelerate their progress. The question is: How to quickly move from an inwardly focused, somewhat siloed HR function to one that embraces an ‘employee-in’ perspective and ultimately create great HR experiences for Employees? Journey maps are shared representations of customer journeys. Visualizing the full experience map, including cross functional process owners, communication / service channels, detailed touchpoint description and resulting experience is a foundational step to break down siloed mental models and build great experiences from the perspective of the customer. Taking the HR example of a typical onboarding journey as seen from the Employee’s perspective: Horror stories are common and clearly impact engagement, attrition and time to productivity: According to various studies from Korn Ferry, Leadership IQ and Aberdeen group, 46% of new hires fail within 18 months of start date while up to 25% leave in their first 6 months. More telling: 90% of new hires decide whether to commit long-term to their new employer within their first 6 months. These stats are scary from a workforce planning and enterprise productivity perspective. They also point to a very leaky Talent Acquisition / Onboarding bucket, reinforcing the importance of well designed, managed, onboarding experiences. To redesign the onboarding journey requires breaking existing walls, both within and outside HR: line manager, L&D organization, HR generalists, Recruitment, IT and systems, facilities, and of course, the Employee. By visualizing the journey together, participants learn to empathetically see journey elements with 360-degree context, opening new and shared avenues for improvement, simplification, radical redesign or introduction of new systems or technologies. As discussed in a previous article on service design thinking, the journey map is an ever-evolving platform that anchors design thinking efforts and experimentation over time. For ‘moments that matter’ in HR, the set of touchpoints and journey attributes are easily transferrable from one company to another, as well as the definition of personas that experience them. That is a potential simplifier for CXHR compared to customer-facing CX where practitioners are either competitive or in businesses that are too different to compare apples to apples. CXHR is an ideal field to apply the cocreation approach and solve the shared problem together. Just as is the case in the Customer-facing world, all touchpoints are not created equal. For example, in a recruitment journey comprising 57 touchpoints, the co-creation group identified seven touchpoints that had disproportionate impact on the overall candidate experience. This allows practitioners to prioritize efforts and focus scarce resources on what matters most: These seven touchpoints and the overall journey design and flow. How do we know if redesign efforts are producing results – is CXHR increasing or decreasing the experience after redesigning a touchpoint or an entire journey? How can journey maps become a living part of the team’s operating system? Alternatively, our beautiful maps will be carefully locked inside a secure closet, along with design thinking training materials, and never seen again. Answer: Journey analytics. Customer Journey Analytics is an evolving field in the Customer facing world. What can we learn from existing implementations and apply in the HR world? At the lowest level, we want to measure and track touchpoint-level experience, to ensure that the basic building blocks of a journey are as good as can be. For example in the candidate journey, this level could translate in ‘2nd interview experience’ or ‘Experience when filling out application on website’. At the highest level, measuring and tracking overall journey experience recognizes the fact that the whole experience is not necessarily the sum of the its parts at the sub-journey or touchpoint level. Practitioners must keep focus on improving the ‘flow’ of the overall journey in addition to improving individual touchpoints. Outcome metrics such as customer churn, repeat business etc… In HR, this translates into Employee Engagement measures – Engagement being an outcome of the employee experience. How to best gather perception data? As customers and as employees, we live in a survey-heavy environment. To improve participation rate and not disrupt employee workflow, survey design trends are following expectations from millennials towards simple, short, ‘in the moment’ surveys and more engaging formats that are both more visual and personal. Another (more qualitative) source of perception data is any data environment where employees can share how they feel, as long as the data can be directly related to the journeys / touchpoints we are measuring. For example, mining social media postings from candidates to improve the candidate journey. CX measurement is the main currency used to frame the success of customer facing teams, recognize wins and know when or what to improve. Executive / CEO levels increasingly review CX metrics as leading indicator of success for sales, service and marketing teams. In HR, CXHR metrics hold a similar potential – to become the most powerful HR operational management and continuous improvement tool available. In the spirit of continuous and competitive improvement, what about Benchmarking? Customer facing CX Benchmarking is a controversial topic due to the difficulty (competition or ‘apple to apple’ issue) of comparing customer journeys across companies. However, CXHR elements (HR Personas, Journeys, Touchpoints) are similar and largely comparable from one company to another. A CXHR benchmarking platform to effectively rate performance at the HR touchpoint / journey level is an exciting development that we’re currently exploring with our cocreation group. We will report on progress as we go. Boost the volume and accuracy of measurements with more conversational and innovative collection of perception data, that includes mining of unstructured text data, embedding micro surveys into workflow apps, etc..
Not all of these trends will directly apply to HR but we can expect that the rapidly developing Journey Analytics field will yield many innovations that will bring us closer to creating an ideal Employee Experience over time. Central governance committee managing all customer journeys. It is typically composed of executive and operational sponsors, program and project managers. CX analytics are continuously reviewed across the board, informing prioritization of CX initiatives. This approach can also apply to HR and regularly feed the HRLT conversation. Senior Journey owners, with direct reporting lines to Exco/CEO level: In some cases, managers of large customer journeys report on journey analytics to the CEO on a weekly basis. One could imagine a similar CHRO-level periodic review of analytics for large HR journeys such as recruitment or onboarding. Global dashboards representing all key journeys across the company (see above): Such a dashboard could become a vital operational management tool for HRLT, reporting in real time employee’s perspective on HR’s performance. It is a bold, ‘truth telling’ approach to HR management as it leaves no place for HR teams to hide by creating direct accountability to great CXHR. As is the case for customer facing teams, the effort is more than validated by superior employee engagement outcomes. Local dashboards, report at the journey (see above) or touchpoint level. They help HR journey owners problem-solve and optimize journey design over time, giving them clarity on what aspect of the experience needs improvement and by how much. These multiple levels of reporting are the key to anchoring the new ‘customer centric’ mindset with HR teams and manage accountability to CXHR improvements. Including benchmarking data at both levels could also be a game changer in terms of identifying CXHR gaps when compared to talent competitors and prioritizing improvement priorities. Winning the battle for Employee Experience in a ‘zero-sum’ talent market will depend on HR Leadership teams’ appetite to master the fundamental tenets of CXHR and execute the approach quickly. Employee journey analytics are the missing link between intentions (visualization, training, hackathons, etc…) and effective, sustained CXHR practice across all HR services. In a mirror image of what is currently taking place in the customer facing world, CXHR KPIs and dashboards will infuse standard HR management frameworks through MBOs, recognition, communication streams and executive reporting. In turn, HR teams will become powerful and engaged agents of change serving the Employee Experience cause, first leading by example within HR, before turning their attention and newly acquired CX skills to the more ambitious (and difficult) resolution of the entire Employee Experience challenge, including systems, workplace and culture. Exciting times! Much as designing customer experience has dominated the thinking of companies competing in today’s digital environment, organizations are now reexamining the employee experience. Recognizing the impact experience has on employee engagement and productivity, companies are taking a more comprehensive view of how to influence it. Our research shows that employee experience is an important and complex issue, requiring companies to evaluate the close connection between employees’ physical, social and cultural environments, as well as the tools and relationships they need to get work done on a daily basis.